Andrew Raftery, May: Cultivating Lettuce, 2014, Engraving transfer printed onto glazed white earthenware, 13″ diameter. Andrew Raftery (Professor, Printmaking) will speak about his new project which combines his proficiency in printmaking, his interest in 19th Century English transferware and his obsession with gardening. Raftery’s printmaking process has always been exacting and exhaustive and he now brings these same qualities to ceramics. 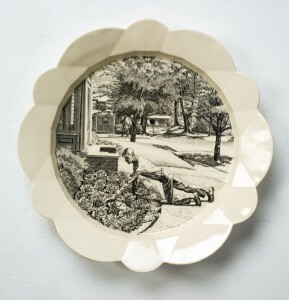 Using antique methods as his starting place, he is working to develop a series of twelve ceramic plates illustrating a cycle of the gardener’s year. Presented as part of The Print Center 100.